I’ve touched it up a little below. 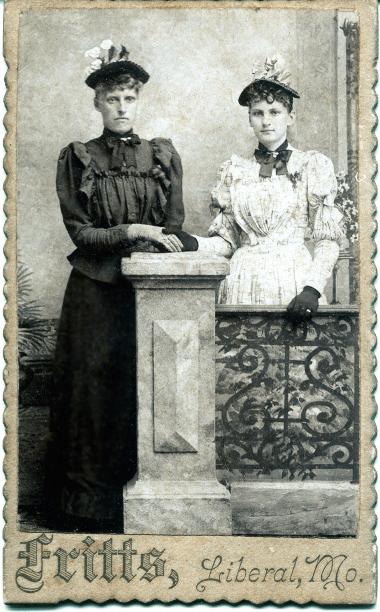 Dora Nancy Fowler Trent is shown here with her niece, Bettie Brewer (married Ray Noyes). Dora Nancy Fowler was born abt 1869 at Osage Mission, Neosho, Kansas, the daughter of John B. Fowler and Mary Jane Johnson. She died at the age of 37, July 1906, and is buried at Carr’s Chapel Cemetery in Greenfield, Dade county, Missouri. She was married to Robert Lincoln Trent, who was born 1877 and died 1958. Dora was the sister of Delana Louise Jane Fowler b. 1854, who married David Nathaniel Brewer. Bettie Brewer b. 1877, their daughter, is the girl with Dora. It’s difficult for me to fix a date for this photo. Either there is a scratch on the photo on Bettie’s ring finger or she is already married and the ring is over her glove. If she was already married, the date of the photo is after May of 1895. I have in my records that Robert Trent was also married to Mary Catherine Brewer, b. 1872 Jan 10, but I don’t know when this marriage might have taken place. She was married many years to George Spurling, who died in 1919. Mary Catherine was widowed in the 1920 census and by the 1930 census she was married to Deaton Rhoades. Rose E. Trent, sister of Robert, also married into the Brewer family. 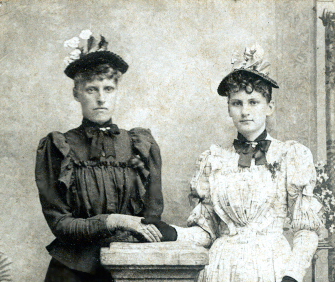 March 25 1895 in Girard, Crawford, Kansas, she married Daniel Brewer, son of David Nathaniel Brewer and Delana Fowler Brewer. Their children were Schuyler and Davie and I have a post on them elsewhere in the blog. So, the Trents perhaps first married into the family with Rose marrying Daniel Brewer in 1895, then in 1900 Robert Trent married Dan Brewer’s aunt, Dora, who was about 31 years of age, only about 4 years older than her nephew. It’s not every day one sees a 60-something marrying a 20-something. By the 1885 Kansas state census of Centerville, Neosho they were no longer together and he was with an Elizabeth, age 44, but the children were in his household and also a year old Mary A. Perhaps Mary had died and Mary A. was her last child and was named for her. Under Elizabeth in the census is a Leander H. Anderson, 26. These two were both from Ohio. I see a family tree at Ancestry which gives Leander as a son of Daniel Anderson and Elizabeth Murdock who lived from 1842-1922. The marriage between Matthew and Elizabeth was a keeper and the 1895 census in Centerville still shows them together, Matthew by now 77 and Elizabeth 52. By 1900, Robert was in Barton county, Missouri. In 1910 he was a widower living with his brother, Perry, in Howard, Elk, Kansas. By 1915 he had married a Hattie D. and is still with her in the 1930 census, but he was buried with Dora Fowler in Carr’s Chapel Cemetery, Greenfield, Dade, Missouri. The photo was taken at Fritts studio in Liberal, Missouri. I have on the blog another photo taken at Fritts which would have been from about the same time. The individuals are unknown.